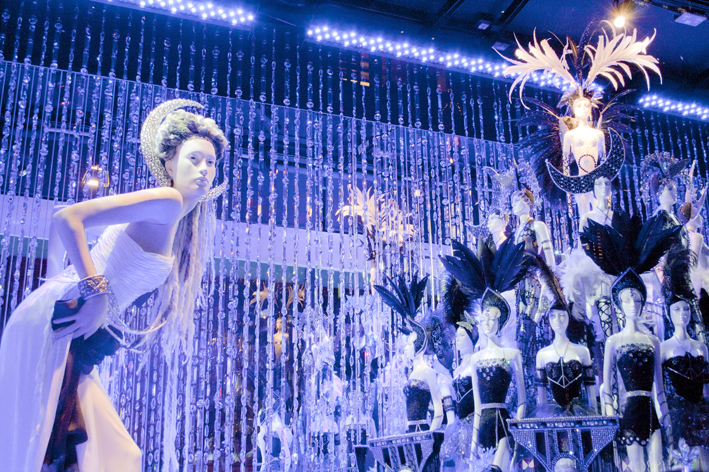 Harrods Christmas displays never lack luxury and opulence. 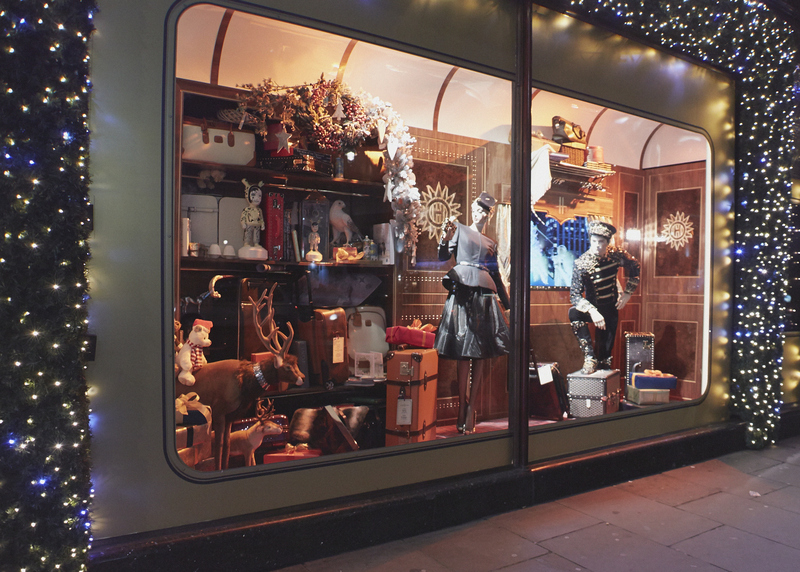 This year the windows have been transformed into a steam train carrying festive gifts and passengers. I have a film and stills to show. Enjoy! 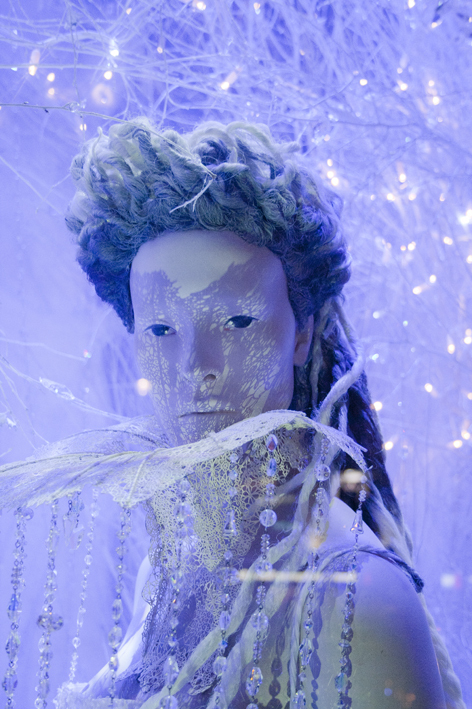 And Merry Christmas from The Window Display Blog too! Only a few days to shop! 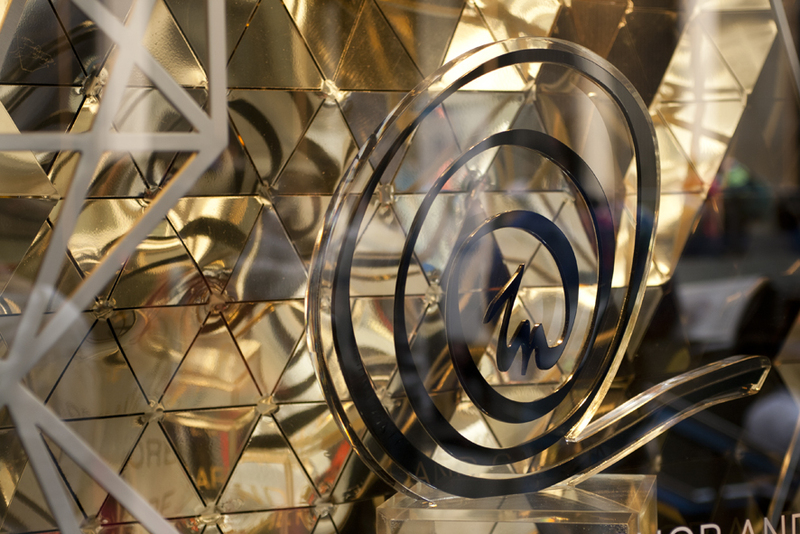 London based retail design company Elemental Design was commissioned to design, manufacture and install a Harrods window to promote the art and culture of Qatar. 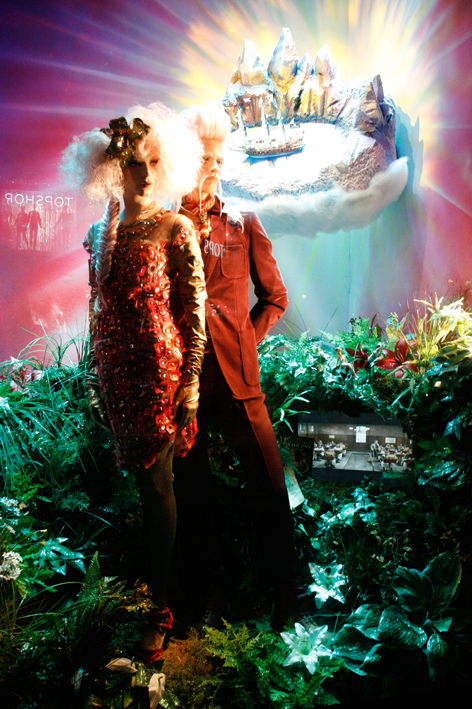 Since 2010 Harrods has been owned by Qatar Holdings, a wealth fund of the Qatar State. 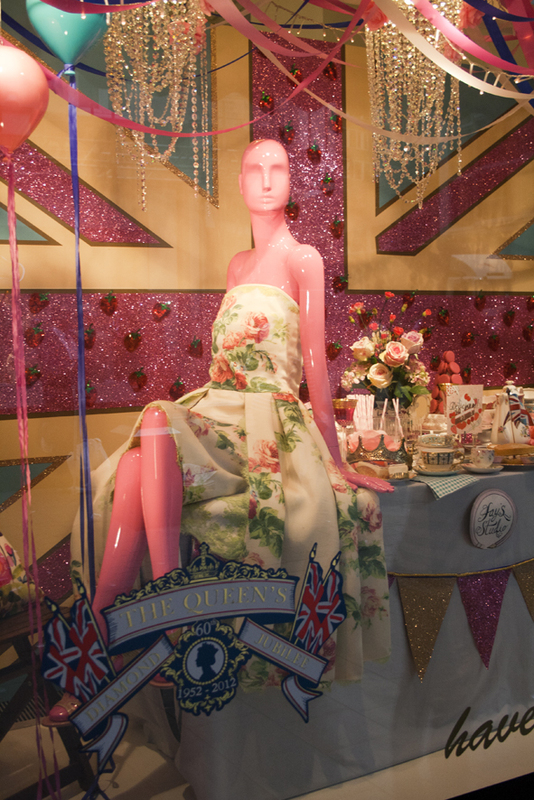 The window invites people to visit the In-Q café and a gift shop on the second floor of the department store. 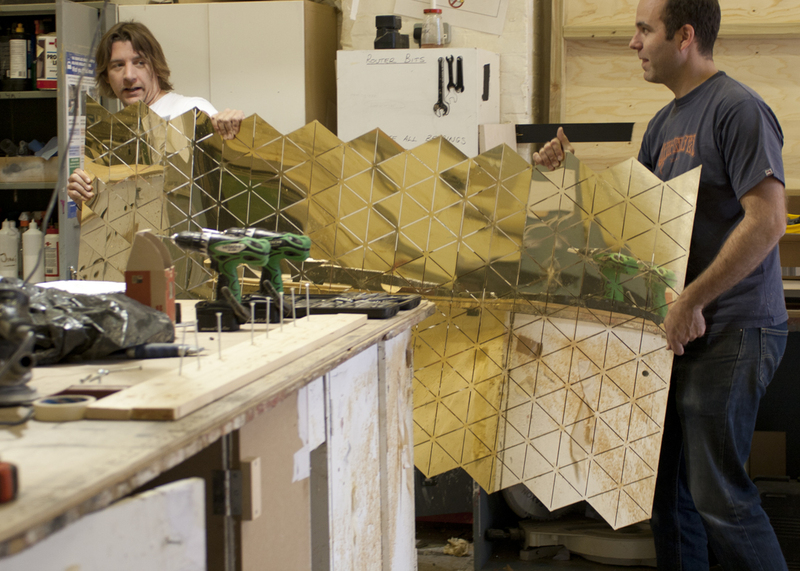 Gary Porter, the founder of Elemental Design has strong relationships with Harrods and visited Qatar in order to learn about the culture and get inspiration for this campaign. 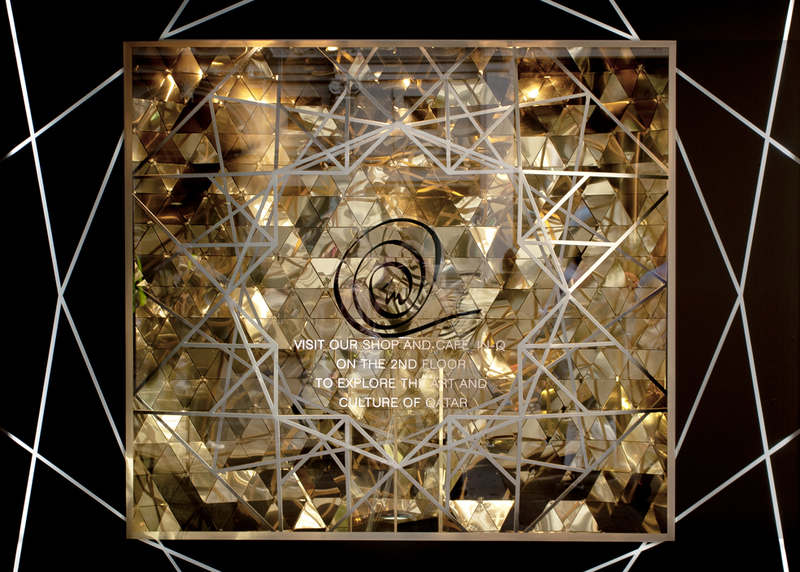 In his design the traditional mosaic pattern becomes contemporary 3D sculpture which is created by layers of high spec geometric frames and a gold faceted wall. In the middle stands the In-Q logo. 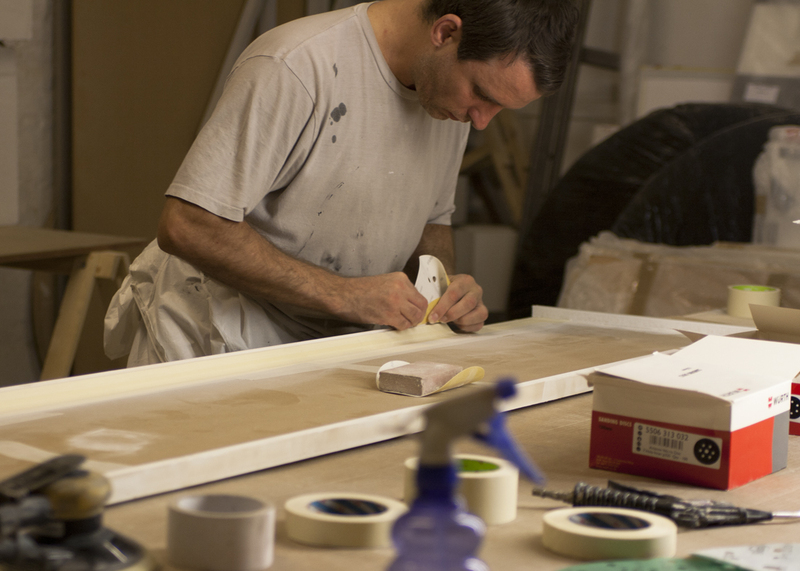 I visited the design company to have peak look at the building stages of the window campaign. The turnaround was very fast and I saw most elements been finished in the premises just a day before the late night install. 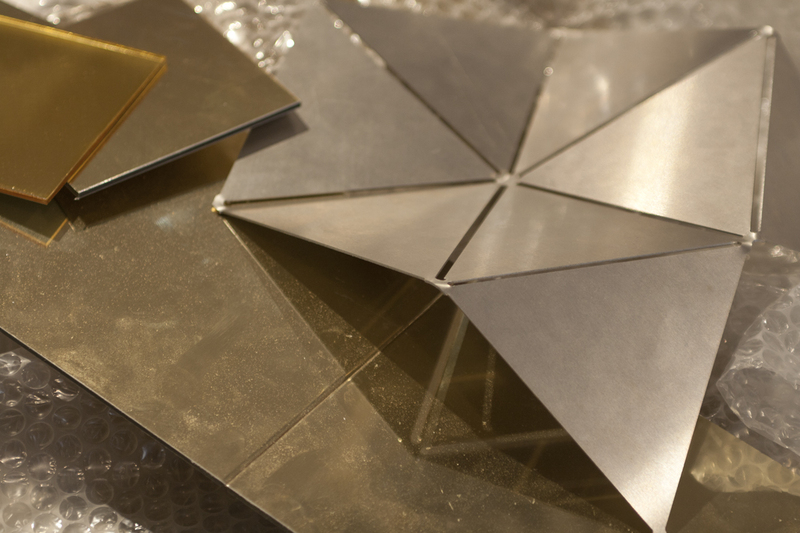 Above is a prototype for the gold faceted panel and undersneath the gold panel arriving at the workshops. 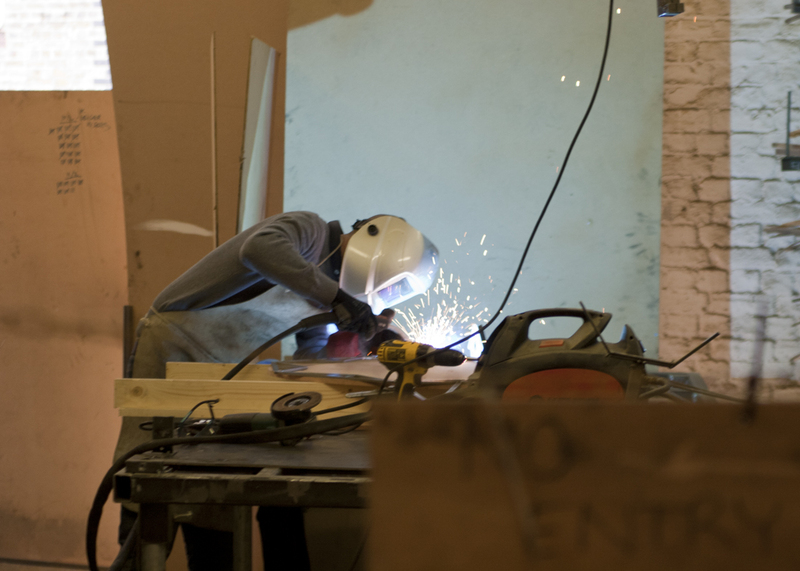 Metalwork being sprayed and finished. I caught up with Gary on their recent work for clients such as Burberry, Louis Vuitton, Westfield LONDON, Museum of Islamic Art.. The list is long and impressive. 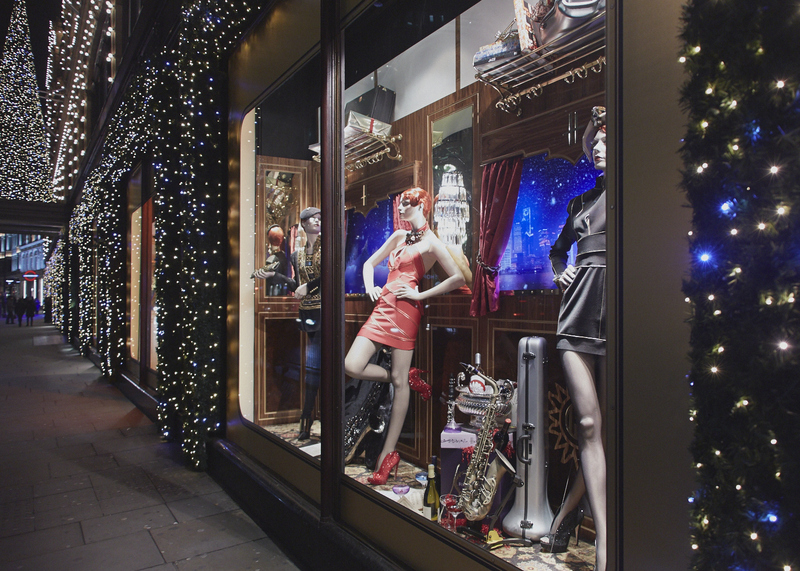 Their expertise include in-store fit outs as well as window displays and can see you through from design, manufacture and final delivery. 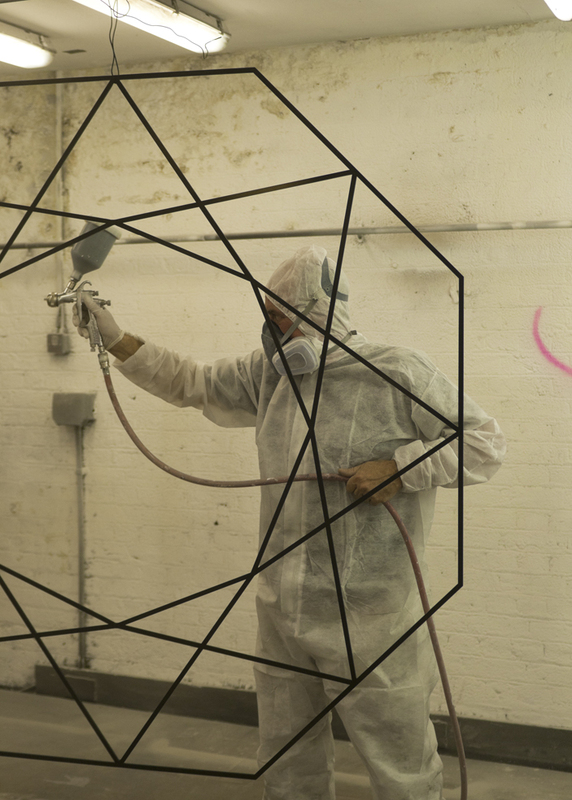 Have a look at their new website and blog at Elemental.co.uk. 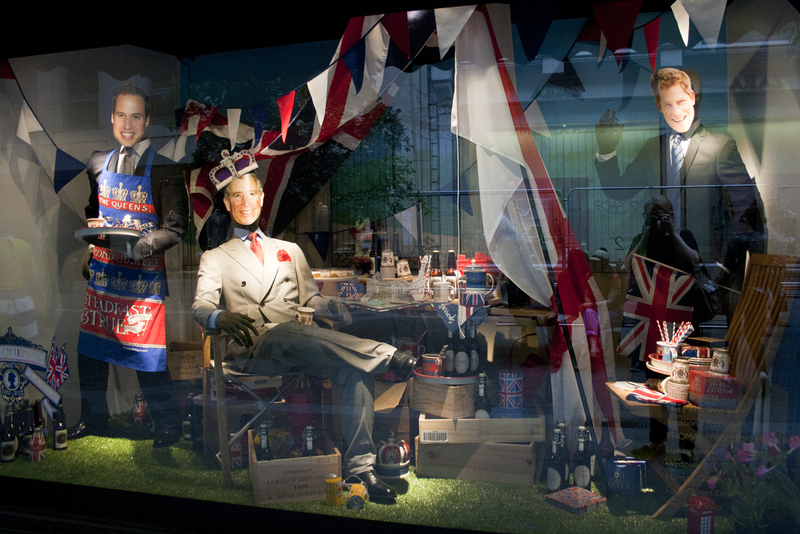 Harrods have gone all out with their Queens’ Diamond Jubilee windows as expected. 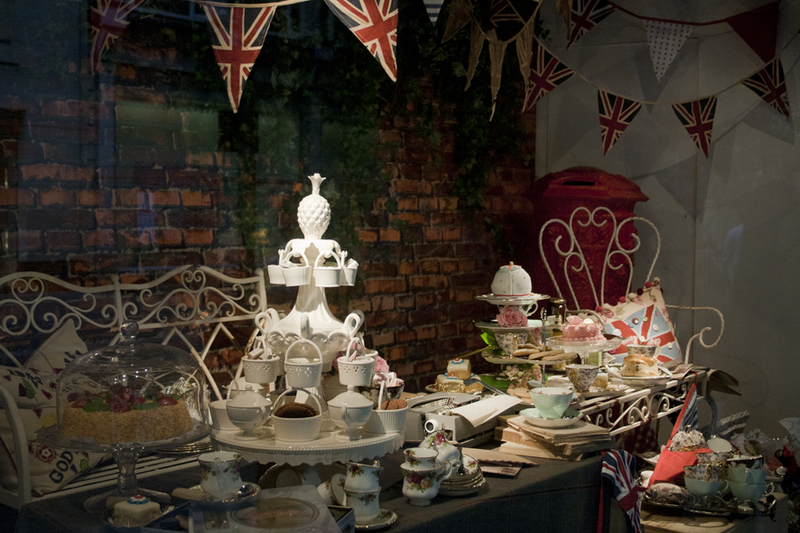 I know the celebrations have now ended, but I can’t not show you all these lovely displays! The day at the races. 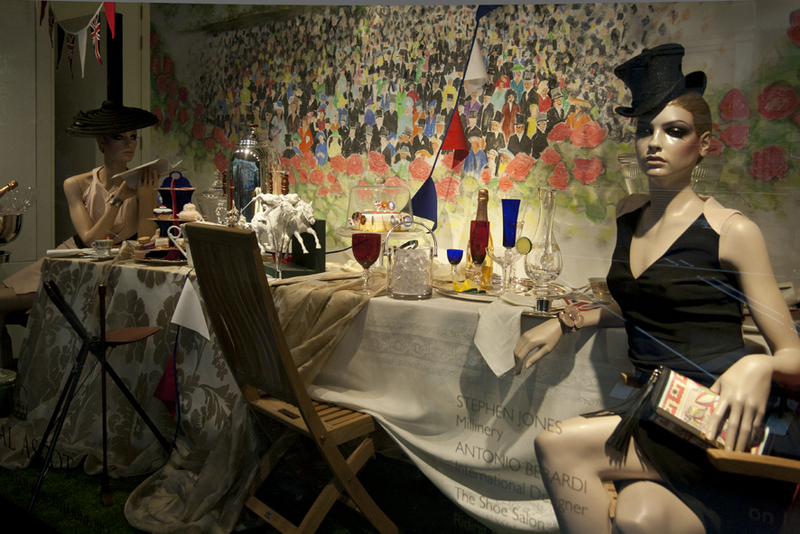 The Queen is a keen participator at horse races and attends The Derby every year, and so do I! 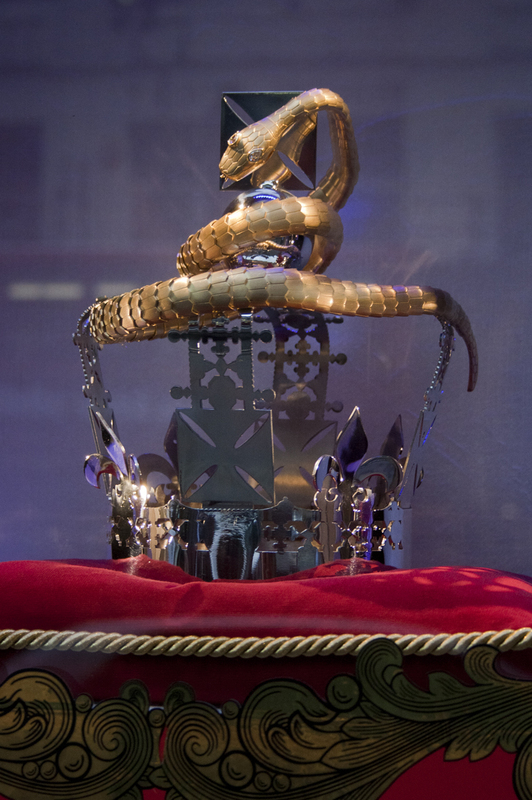 The whole lenght of the Brompton Road has these different crowns in the windows, they really are amazing! The masks are back, the last time I saw them around was at the time of the Royal Wedding last year. J.M. 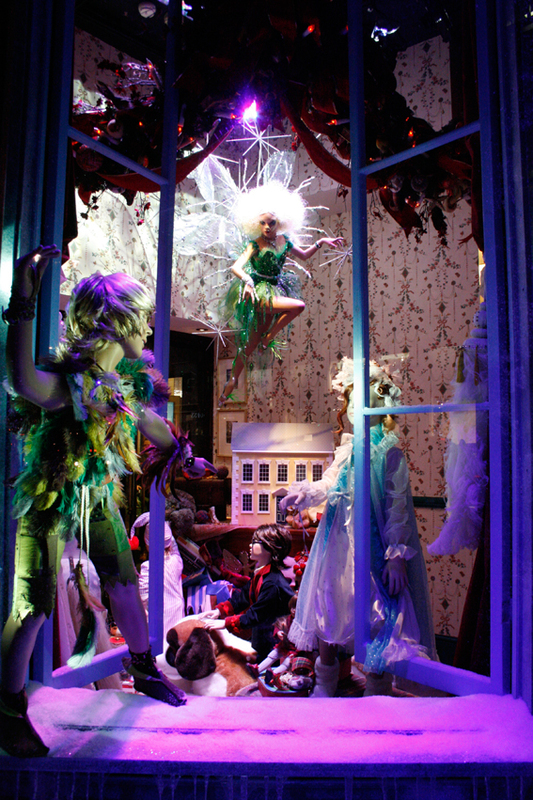 Barrie, the creator of iconic story Peter Pan was born 150 years ago, and Harrods are celebrating this with their 2010 Christmas windows. 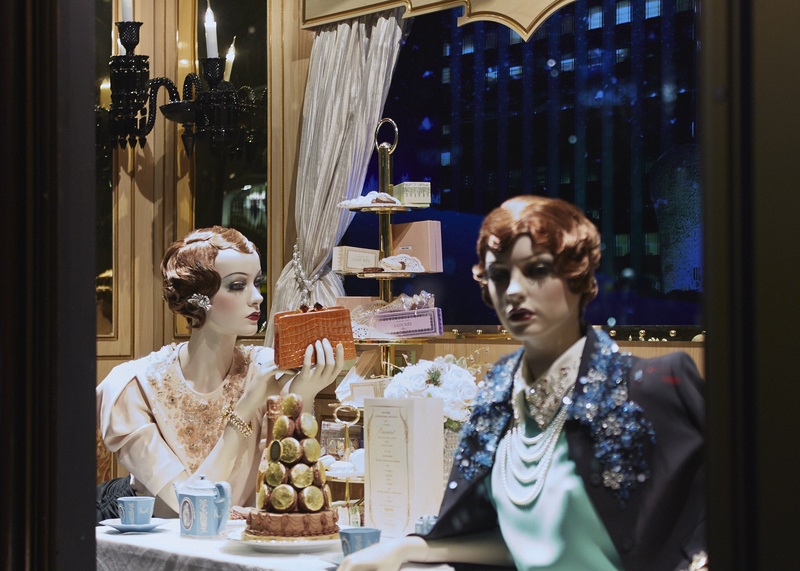 They call it a vintage Christmas and it is luxurious as always. The windows are absolutely beautiful and feature classic scenes and characters from the story. 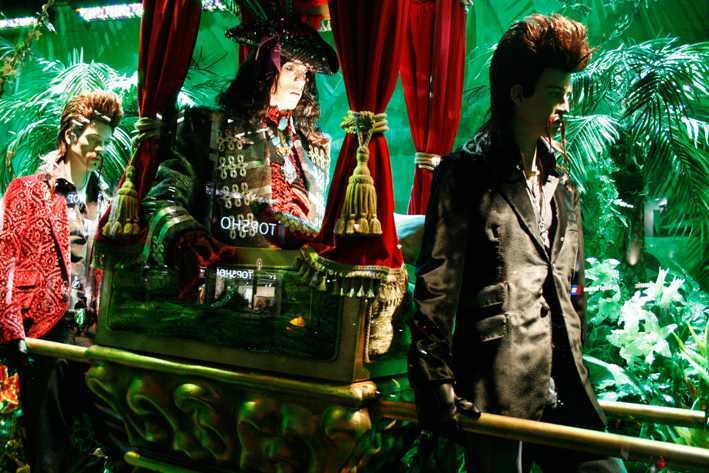 To go with this years theme they stock a Peter Pan Collection, which includes Christmas decorations and gifts. In the story Peter Pan refuses to grow up and flies off to Neverland, makes friends with Tinkerbell, the fairy, mermaids and Indians. Peter is the leader of his gang The Lost Boys. 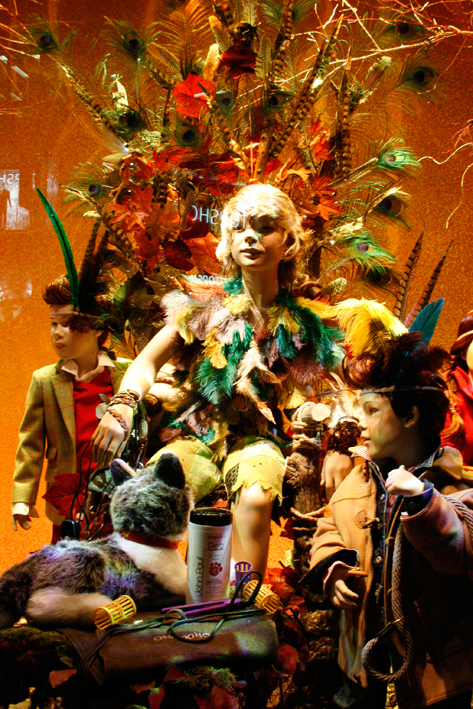 In this adaptation of the story Peter’s outfit is made out of autumn coloured feathers. Obviously in the story Peter can fly. I love this miniature London. 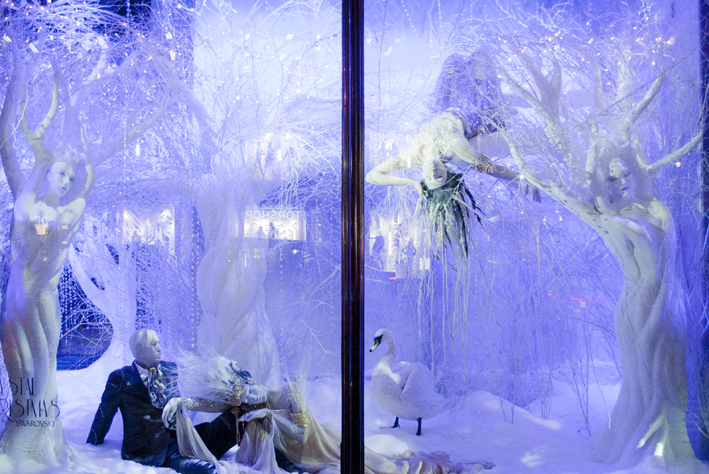 The whole window looks magical. Captain Hook, Peter Pans enemy. The new book by Tony Morgan boasts some excellent photographs of the best recent windows in London, New York, Paris and beyond. Morgan takes us on a personal journey with his writing, which shines through his passion for display. 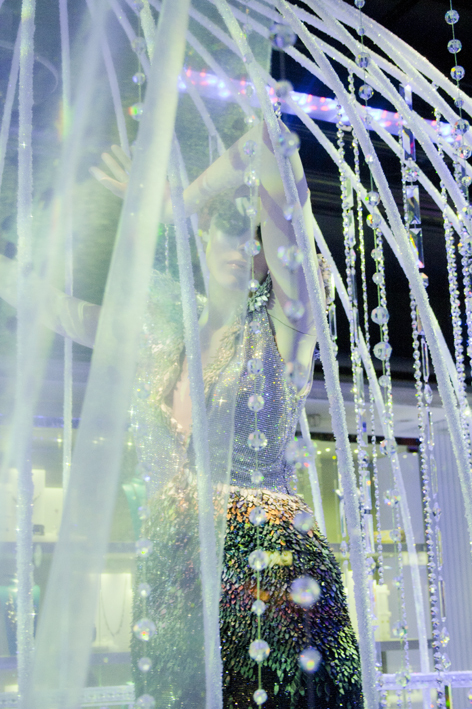 The book is well structured and looks at windows from different perspectives in seven chapters such as Colour, Lighting and Theatre. The book covers the top department stores from New Yorks Bergdorf Goodman to London’s Selfridges (Morgan worked as Head of Visual Merchandising there for 18 years), designer shops such as Prada and Moschino, as well as high street fashion concepts by TopShop and Zara. 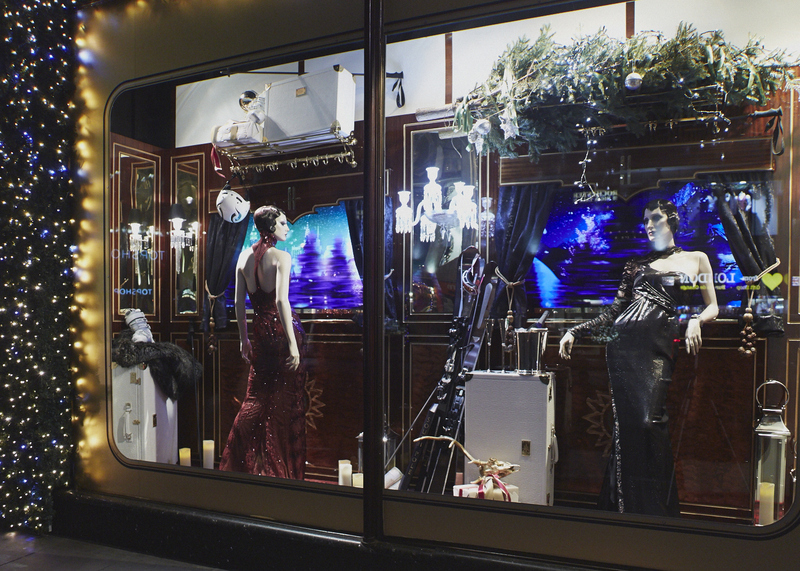 With relevant images and captions he shows how a window is more than just a useful space to promote products. 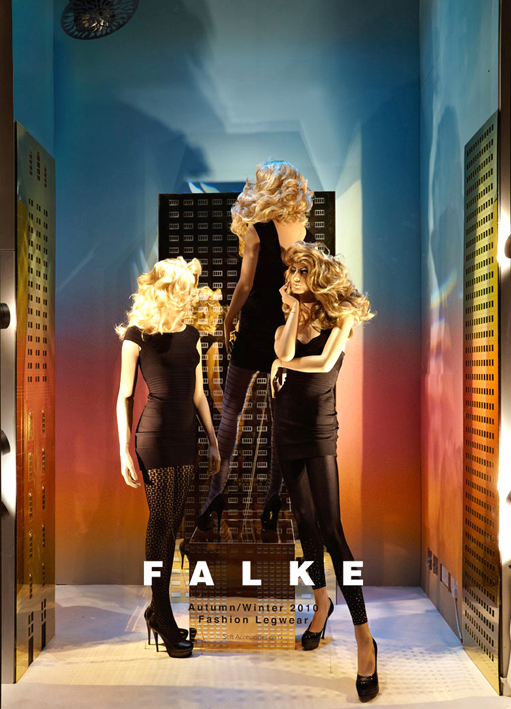 “Today these glazed canvases promote the store’s brand identity, keep the customer informed of fashion trends and ultimately drive sales.” He explores several ways to make the stores windows stand out from their competitors. Would a tyrannosaurus Rex eating a mannequin get your attention? 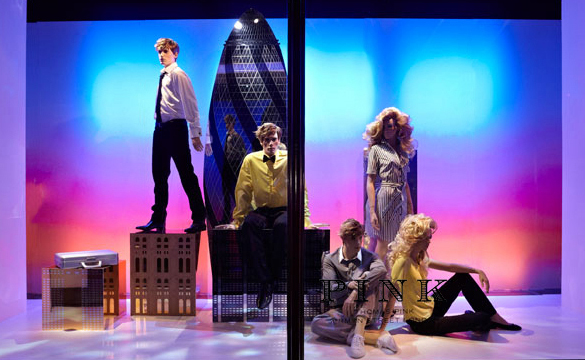 He quite rightly argues that good windows are the talk of the town. 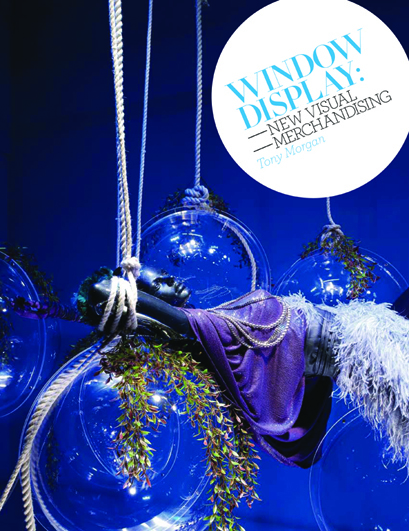 The book successfully highlights how different elements of window design can inspire and increase sales. 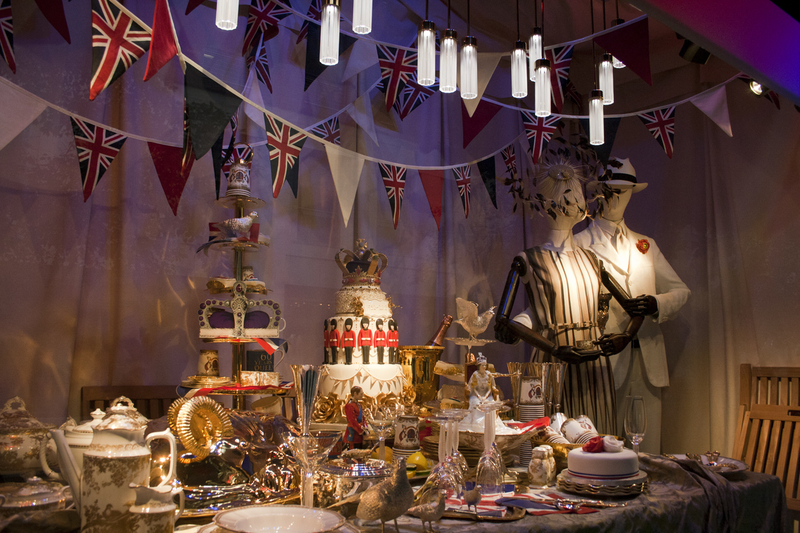 Morgan celebrates ”the creative retail gurus” who design the schemes. I always wonder who designed the windows, therefore I wish he would have explored this further. Overall I strongly recommend the book. 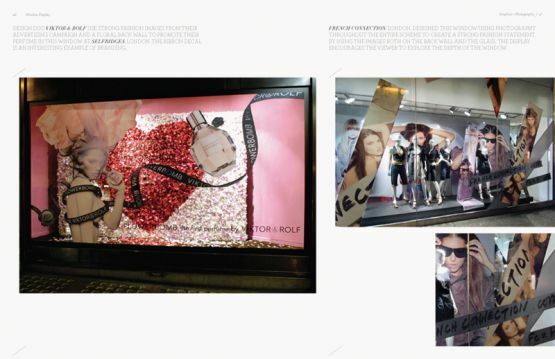 Tony Morgan teaches visual merchandising at Fashion Retail Academy and is a guest lecturer at London College of Fashion. 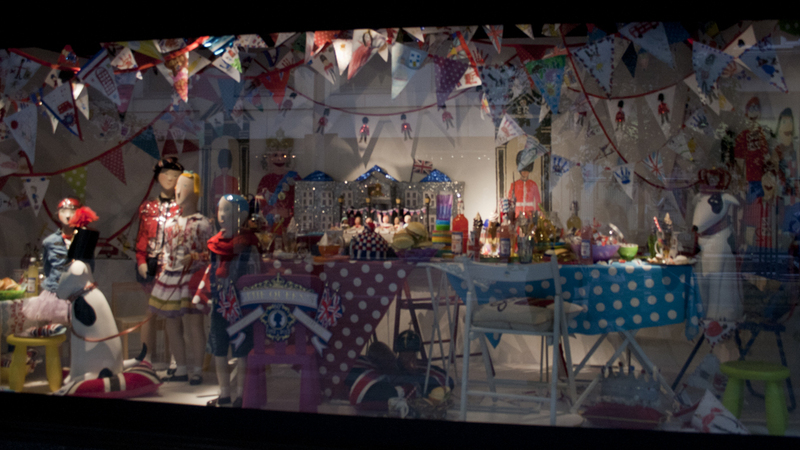 His previous book is called Visual Merchandising: Window and In-store Displays for Retail. All images by Laurence King Publishing. 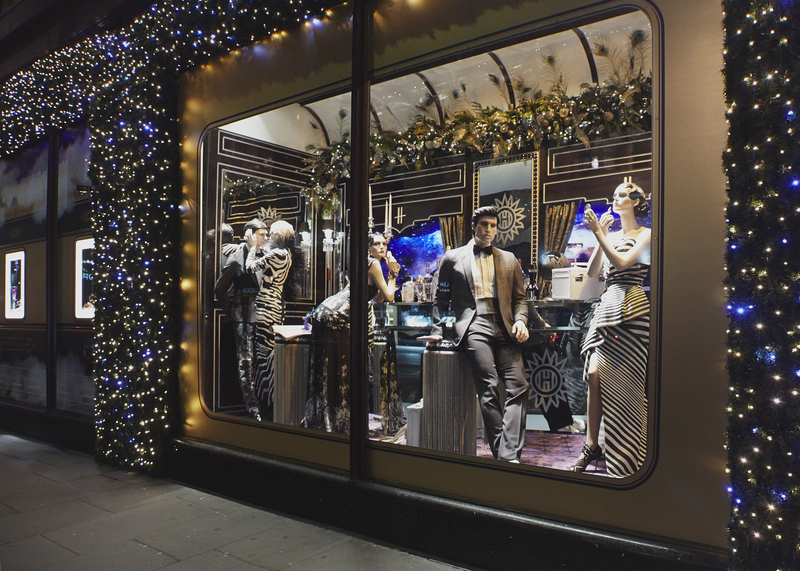 These Harrods windows feature buildings not just from the window display capital city London ( I would say that now wouldn’t I?) , but also from New York and Paris just to mention a few. 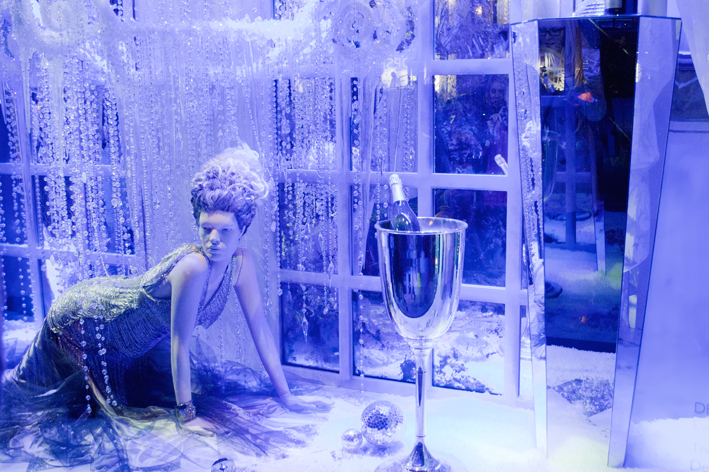 I often get a global feel of Harrods windows. These ones have fashions from different countries in them, but not necessarily from the corresponding cities of the schemes. 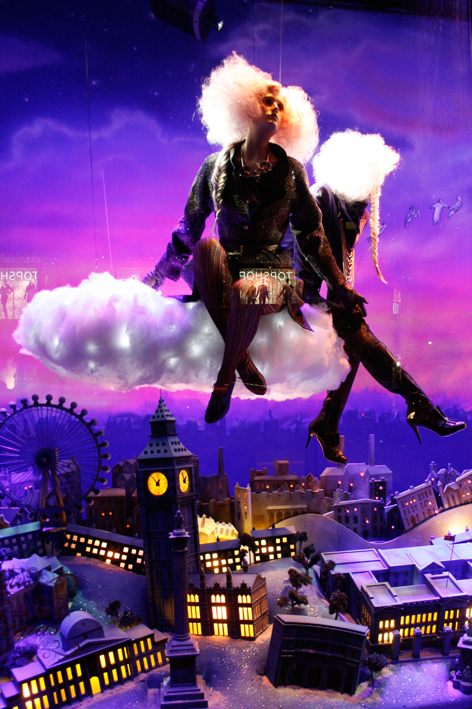 The windows are a collaboration between Harrods and London agency JustSo. 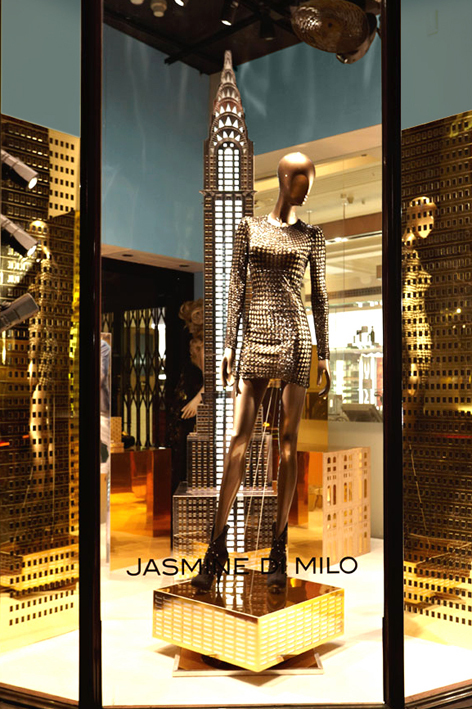 Some of the shiny building have been used as pedestals for the mannequins. Gradients of hot colours decorate the backdrops. 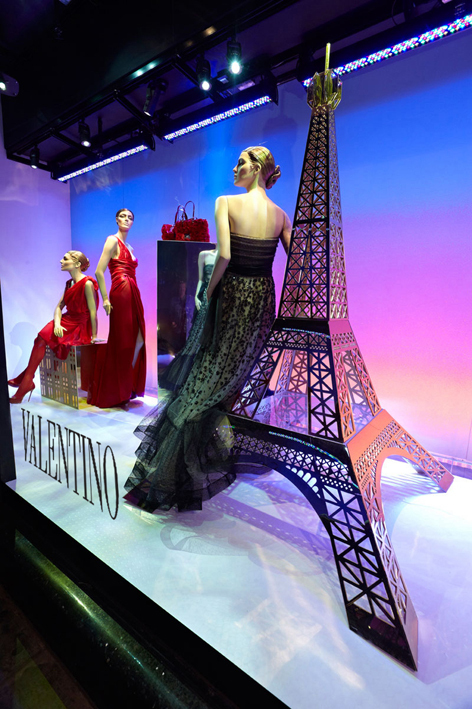 Different types of mannequins have been used for some of the cities. Images by JustSo. 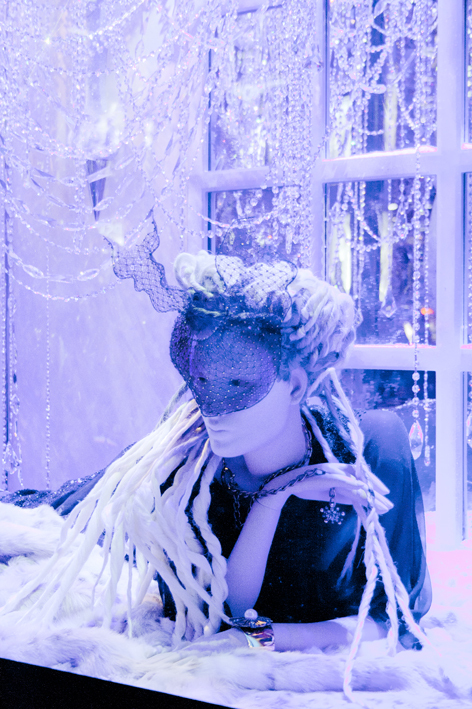 Just So is a boutique visual communications and event management agency based in central London who focus on creative design, visual communications, art direction, window displays, party planning and events for the lifestyle, luxury, corporate, retail and fashion sectors. Check them out.